Our “Second-in-Command”, Kyle Bradshaw, joined the ATC Communications team in 2006. Coming from a VOIP (Voice over IP) background, he brought a new flavor of broadband experience to the table. 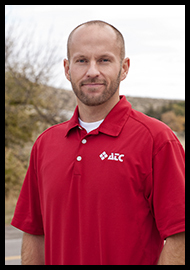 Shortly thereafter, Kyle also became ATC’s Office Manager – overseeing all things billing and customer service related. He even managed to develop a marketing and advertising initiative as part of his daily regimen. In his free time Kyle is an avid outdoors-man, enjoying everything from hunting and fishing, to camping and quests for Big Foot. Kyle loves cold beer and BBQ ribs, anything internet related, and of course, spending time with his family and friends. We’re thankful to have this intelligent, fun-loving ring-leader guide our ATC team.